In the years after World War II, the bleak yet beautiful plains of South Dakota still embody all the contradictions --- the ruggedness and the promise --- of the old frontier. This is a place where you can eat strawberries from wild vines, where lightning reveals a boundless horizon, where descendants of white settlers and native Indians continue to collide, and where, for most, there are limited options. René shares a home, a family and a passion for dance with her older brother, Leon. Yet for all they have in common, their lives are on remarkably different paths. In contrast to René, a born spitfire, Leon is a gentle soul. The only boy in their ballet class, Leon silently endures often brutal teasing. Meanwhile, René excels at everything she touches, basking in the delighted gaze of their father, whom Leon seems to disappoint no matter how hard he tries. As the years pass, René and Leon’s parents fight with increasing frequency --- and ferocity. Their father --- a cattle broker --- spends more time on the road, his sporadic homecomings both yearned for and dreaded by the children. And as René and Leon grow up, they grow apart. They grasp whatever they can to stay afloat --- a word of praise, a grandmother’s outstretched hand, the seductive attention of a stranger --- as René works to save herself, crossing the border into a larger, more hopeful world, while Leon embarks on a path of despair and self-destruction. 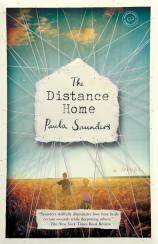 Tender, searing and unforgettable, THE DISTANCE HOME is a profoundly American story spanning decades --- a tale of haves and have-nots, of how our ideas of winning and losing, success and failure, lead us inevitably into various problems with empathy and caring for one another. It’s a portrait of beauty and brutality in which the author’s compassionate narration allows us to sympathize, in turn, with everyone involved.